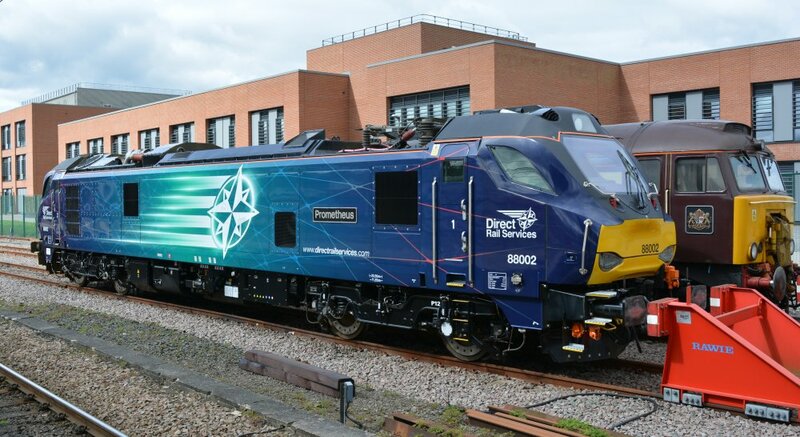 The Class 88 bi-mode locomotives are a type of mixed traffic electro-diesel locomotive manufactured by Stadler Rail for Direct Rail Services in the United Kingdom. The design is part of the Stadler Euro Dual family. Class 88 88002 "Prometheus" at York in April 2018, don't know why it was there? Class 88 electric supply system is 25 kV AC 50 Hz overhead. The continuous power rating is 4000 kW (5360 hp) giving a tractive effort of 250 kN (56200 lbf) at 28 mph. Class 88 dual mode (diesel/electric) locomotives have a maximum speed of 100 mph. Route availability 7. All of the Class 88 locomotives have been named, with seven of the ten locomotives reusing names from the 1950s vintage Class 77s, later sold to the Netherlands as NS Class 1500, while one locomotive (88002) bears the name of a former Class 76 locomotive. Enter specifics e.g. class, trip, event, locomotive, train, station, location, railway line trip, heritage line, scenic route, anything of railway interest!